Caroline Wozniacki defeated Anastasija Sevastova 6-3, 6-3 to win the China Open and her third WTA title of the year on Sunday, while Nikoloz Basilashvili of Georgia beat top-seeded Juan Martin del Potro 6-4, 6-4 in the men's final. ''Last time was different. 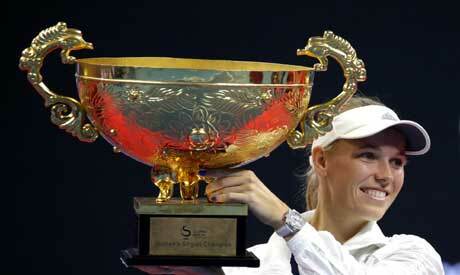 I was 20 years old,'' Wozniacki said. ''A lot has happened since then. ''I think the second set should have been closer. Maybe I had even chances to win it,'' Sevastova said.